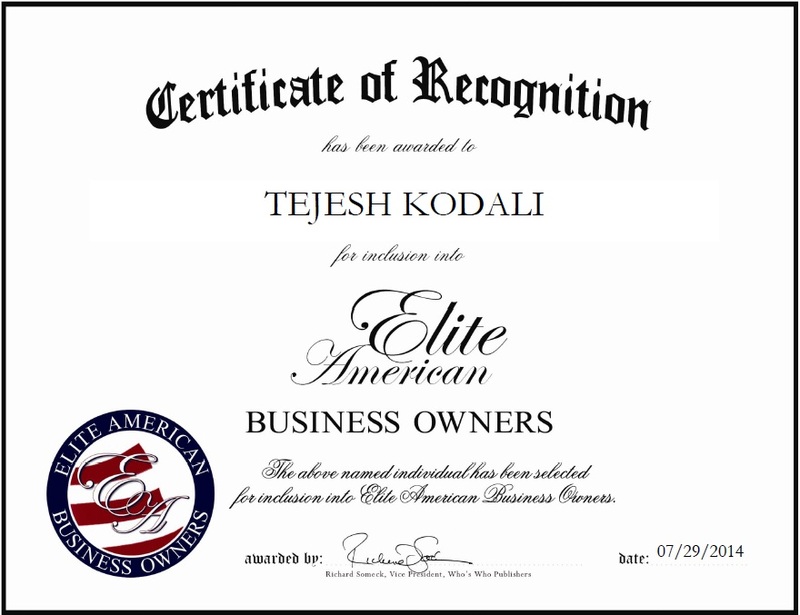 EDISON, NJ, February 26, 2015, Tejesh Kodali, Managing Director and CEO of ProMatrix Corp, has been recognized by Elite American Business Owners for dedication, achievements, and leadership in retail information technology and strategic business development. In his executive leadership role, Mr. Kodali is in charge of developing cutting edge information technology projects and solutions, consulting and outsourcing, and traveling to a number of different regions, in an effort to champion the initiatives of the lauded information technology company. He provides technology businesses for global companies, adds new talented employees to the team, and promotes technology, infrastructure, and alternative fuel companies to the roster. He also presents technology-related business solutions to support global companies. Mr. Kodali is endowed with more than 20 years of experience in information technology, mergers and acquisitions, finance and environment Industries. His expertise includes managing both private and publicly-held companies. He is an entrepreneur and an environmentalist. His entrepreneurial drive and long track-record of operational and financial success has resulted in significant expansion and evolution throughout his career. He has the distinction of promoting technology, infrastructure and alternative fuel companies. This entry was posted in Information Technology and tagged business development, business management. Bookmark the permalink.